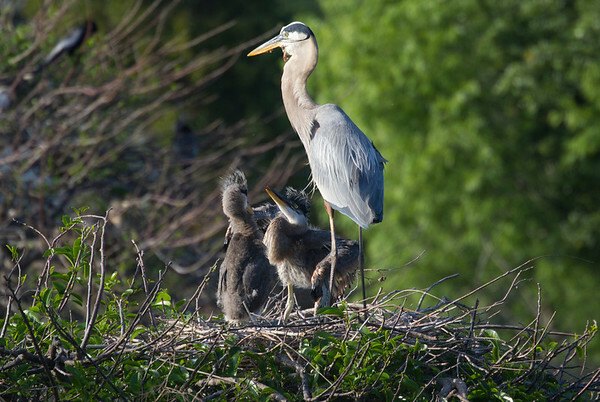 Hungry Great Blue Heron nestlings. I was disturbed seeing something protruding from beneath the parent bird's bill out of the neck thinking perhaps voracious youngsters pecked it open . As Great Blue Herons are reported to quadruple their consumption of food..fish..frogs..etc...while tending to their young I gather it is a case of something 'caught in its craw' which didn't go down and was forced out the neck lining. I saw this with another nesting adult previously and perhaps it is not an uncommon result of the volume of eating and regurgitation required to support the appetites of the chicks even though I found no specific mention in my reading thus far. A couple of pictures to follow show this as well. Its a wild world and yet I find it disturbing to see this elegant creature in such an inelegant condition. Follow up: I came to learn that the neck of this bird was damaged in the past and that sometimes what is visible is the bird's tongue as well as other things perhaps. I have utmost respect for the tenacity of nature that keeps this adult tending young each season despite its injury.